If you like big bold flavors but not ones that burn your tongue off, I think you’ll really enjoy my recipe I’m calling Smoky Beer Chili. This recipe makes a big ol’ pot of chili, so it’s perfect to serve to a gathering of hungry football fans for that big game day party. Make it in advance, and it freezes beautifully too. Win, win. 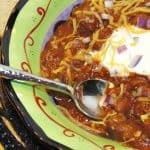 **Please Note – The printable recipe card with detailed instructions, complete ingredient measurements, and nutritional information for making Smoky Beer Chili is available near the end of this post. **Note – This is an updated recipe post. The original photos are from 2013 but the recipe has remained the same. 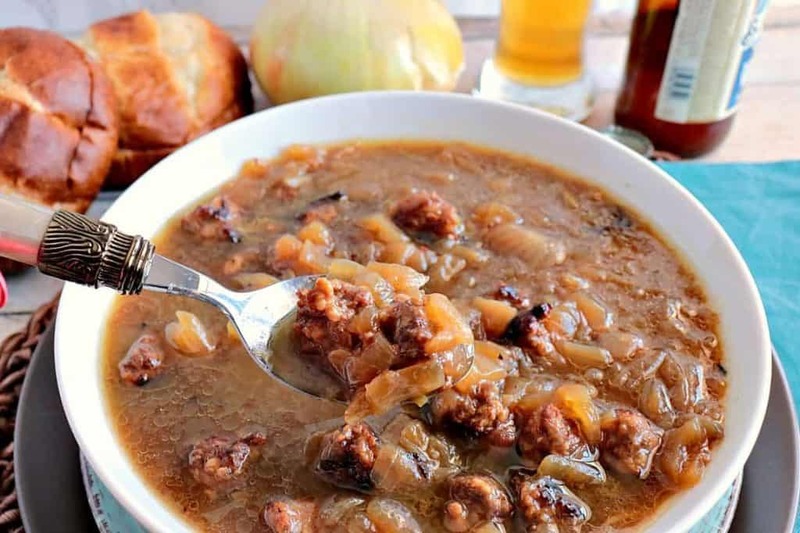 The day I originally made this Smoky Beer Chili (back in 2013) I tried to cut back a little bit on the calories by using a combination Italian sausage blend of chicken and pork. Everyone in my family really enjoyed this meal and nobody even suspected that the sausage wasn’t what they were generally used to. However, please feel free to use any Italian sausage you love. 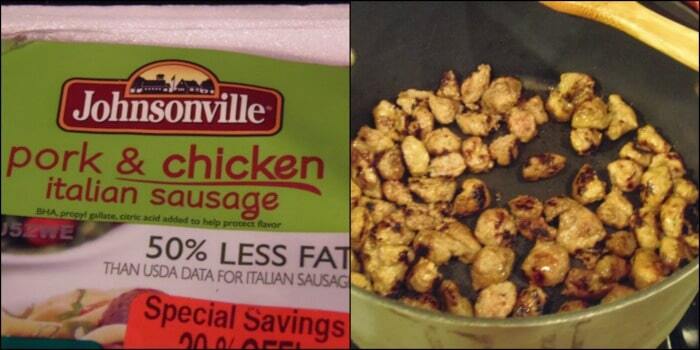 I promise I’ll never tell, and if truth be told, I’ve not seen the chicken/pork Italian sausage blend back in the marketplace since I’d found it in 2013. 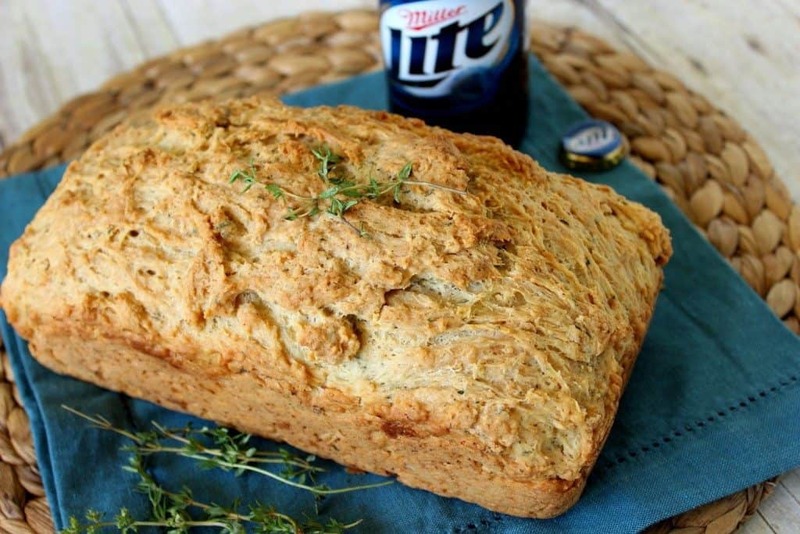 I served my Smoky Beer Chili with a nice loaf of Whole Wheat Tzatziki Bread. It was a simple and delicious meal that satisfied the entire family! In a large soup/stew pot over medium/high heat, cook (and crumble) the Italian sausage to a deep golden brown. Add the onions, chili powder, cumin, paprika, coriander, garlic, and red pepper flakes and cook together, stirring occasionally until the onions soften slightly (approximately 5 minutes). 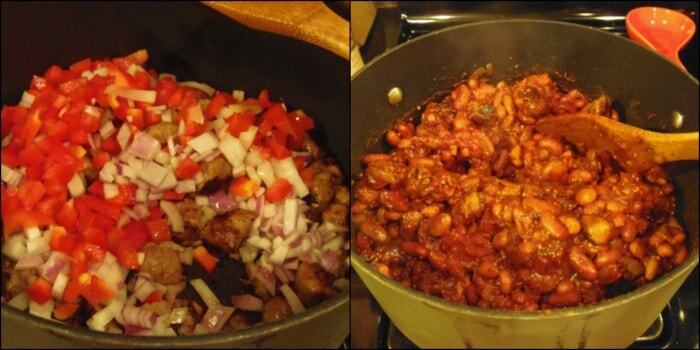 Reduce the heat to low and add the drained kidney and pinto beans. Stir. Add the tomato paste and stir to combine. Cook for 1-2 minutes. Add the crushed tomatoes, diced tomatoes, and the beer. Stir well. Bring the pot of chili to a low simmer, stirring occasionally for at least a half an hour (but longer is better). Right before serving, stir in the small can or fire roasted jalapenos and remove from heat. Serve with suggested garnishes, if desired, or freeze until you’re ready to thaw, reheat, garnish and serve. This smoky beer chili is hearty and satisfying and will warm your heart (and stomach) on a cold winter’s day. I like to garnish ours with a dollop sour cream, a touch of shredded cheddar and some additional chopped red onion for an added punch of flavor. Below is the printable recipe card for today’s Smoky Beer Chili. 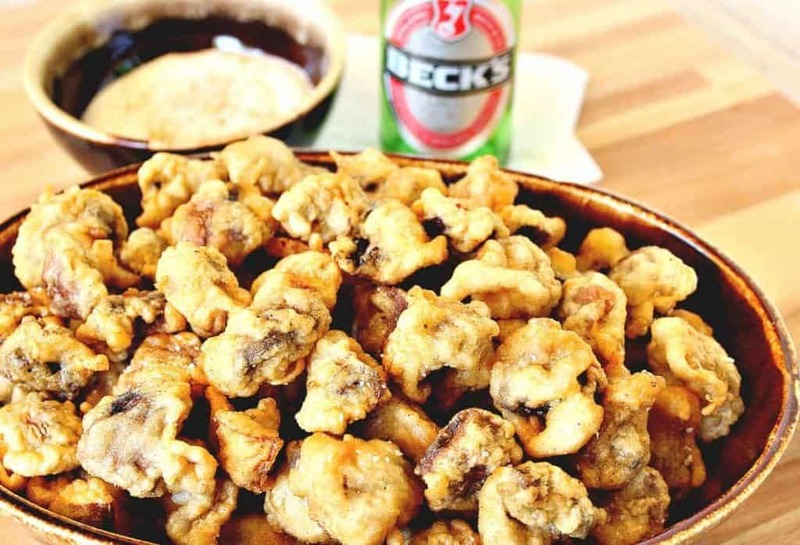 If you’ve enjoyed this recipe and look forward to making it (or have already made it), I’d appreciate if you’d take a moment to give it some feedback by way of stars near the comment section at the end of this post. Thank you so much! 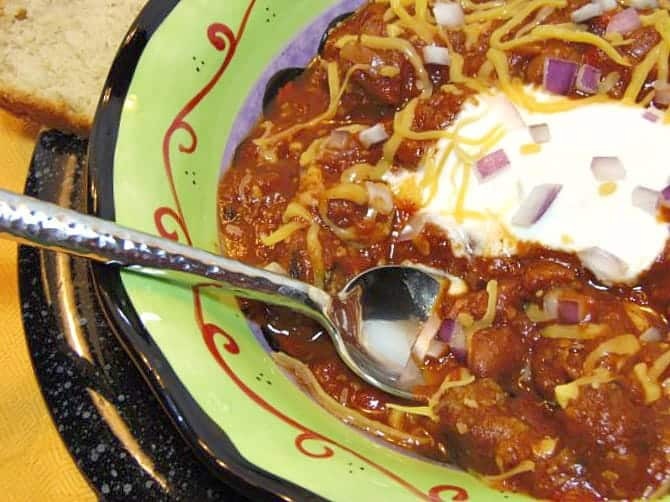 If you like big bold flavors but not ones that burn your tongue off, I think you'll really enjoy my recipe I'm calling Smoky Beer Chili. Add the crushed tomatoes, diced tomatoes, and the beer and stir well. before serving, stir in the small can or fire roasted jalapenos and remove from heat. Serve in bowls with garnishes, if desired. I sincerely hope you’ve enjoyed today’s recipe for Smoky Beer Chili as much as I’ve enjoyed bringing it to you! That's one lovely looking chili and I'm really curious to see your Whole Wheat Tzatziki Bread recipe. I love making chili but have never made it with Italian sausage before. Don’t know why since I love both. 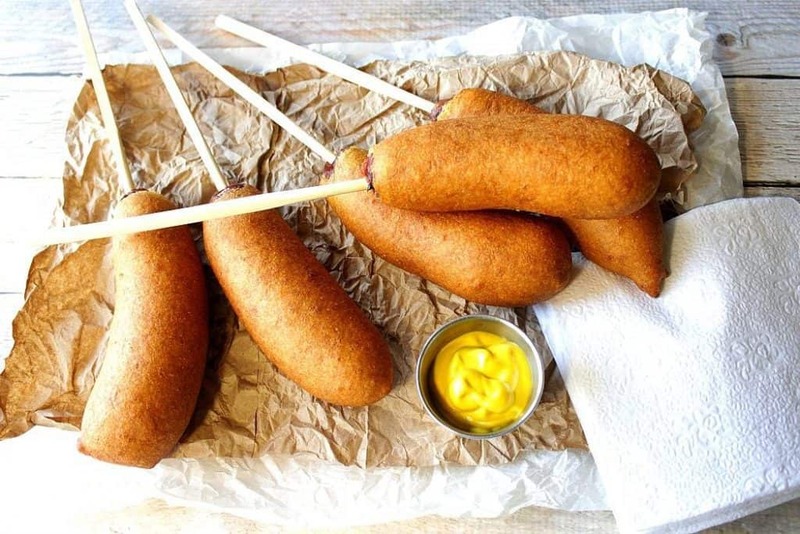 This recipe sounds super easy and love the addition of the roasted jalapenos. This will be perfect to stave off the cold this winter. Once you try Italian sausage in chili, you’ll never go back. Thanks for visiting, Linda! Enjoy the recipe. We are going to be snacking on this all weekend! Thanks!